It has been such a long time since my last post, however, the stitching never stopped. All the blocks have been joined and the layers pinned together! Hope to have it quilted in the next couple of weeks. The rows were joined together while we were in Portugal and the layers put together before we returned home. Since then the quilting has been slow and enjoyable .The large white stitches are now nearly covering the flowers and I am working on the borders. Hope to make a multi coloured binding. I will post more photos when it is finished. 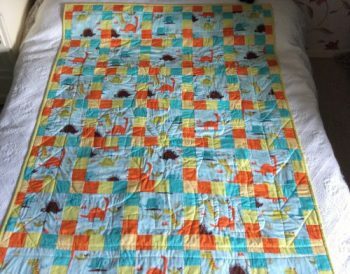 This quilt is a pattern from Stack N Whackier by Bethany S Reynolds it has been in my UFO box for some years and I have always loved the colour! So it was time to layer it up and now it will be machine quilted before Easter as I want to take it back to Portugal. I will come back next week and tell you my to do list for 2017. A big thank you to all that have stopped by while my blog had a break. We have been on our travels from the UK to Portugal. The first part of the journey was to drive down to the south coast and catch a ferry from Portsmouth. The ferry took 28 hrs and we arrived at Bilbao on the north coast of Spain. Then a 7 hr drive down to Central Portugal. Hubby has started cutting the grass, there’s not a lot of green!!! The house had been empty since April so the spiders had taken over and it took a couple of days to clean up . We have to work in the garden and some of the house could do with a lick of paint. Work takes place early in the morning as the temperature gets into the mid 30’s by noon. This post should have posted on Monday so I apologise to the girls . Please go check out these great blogs and discover their stories. 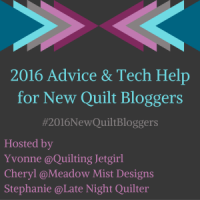 Many thanks to Stephanie, Yvonne and Cheryl for hosting , if you visit their blogs you still have a chance to win prizes and meet the other new bloggers. I packed Daisy Do quilt and a quilt top I made about 12 yrs ago . Hope to get some sewing in as we will be here all summer. 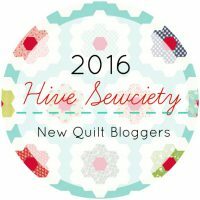 The New Quilt Bloggers Hop is back this week after a short break. Had hoped to have all the rows finished by the end of June, just ran out of time! So now have set the finish date for the end of July. Just 3 more rows to add and then the border. Things are a little slow, sewing wise, over the summer. Will post when there is progress or news to share. Have a great summer or if you are in colder climes keep warm. This is the place I keep track of my sewing adventures and share them with you. How did my blog get its name? My husband’s name is Bri/an and mine is M/ary so take the start of his and the end of mine and you get Briary! Part of my blog belongs to him as he is always supportive and on hand when I ask is this OK or does that sound right. When I was about 5yrs old there was a very kind lady, who lived next door. Her husband was in the Navy and spent long periods at sea, they had no children. I used to spend many happy hours at her home learning to knit and sew and there were always plenty of chocolate biscuits. In my teenage years I altered and made clothes. Then, when the family arrived, moving on to making things for the home. About 15 years ago we lived in the Middle East and I belonged to the Kuwait Quilters , meeting and learning from so many talented quilters from all over the world. Had always wanted to make one of these and last year it was made in plenty of time for Christmas. Not sure which is the front and which is the back? The dinosaurs started as the front, however, the animals seem to be the favourite! 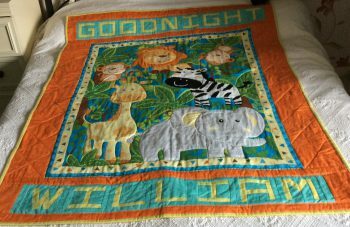 After dancing on the quilt, giving the lion a kiss, it was time for a nap. 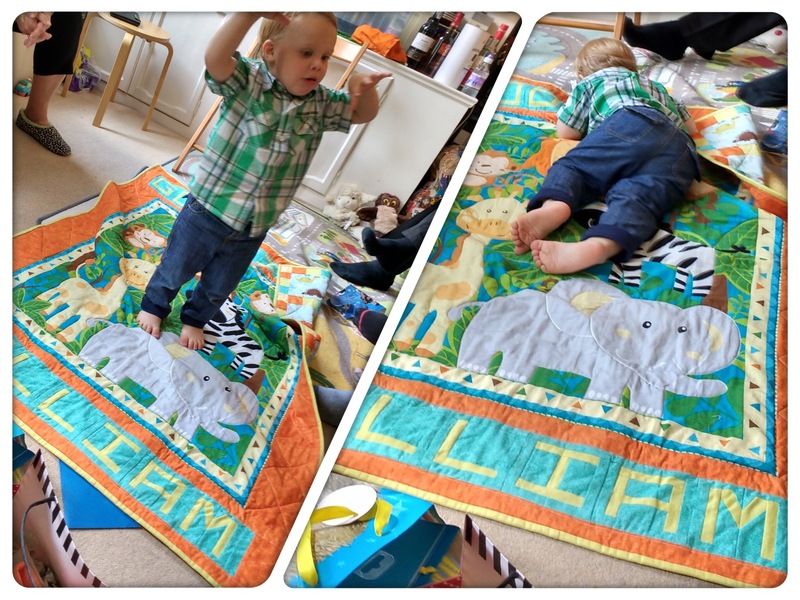 I think he liked his quilt. Well, I also love embroidery so I have been mulling over doing a candlewick quilt or adding mountmallick embroidery, but then again I’ve never done cathedral Windows, could add hand embroidery to that!!! 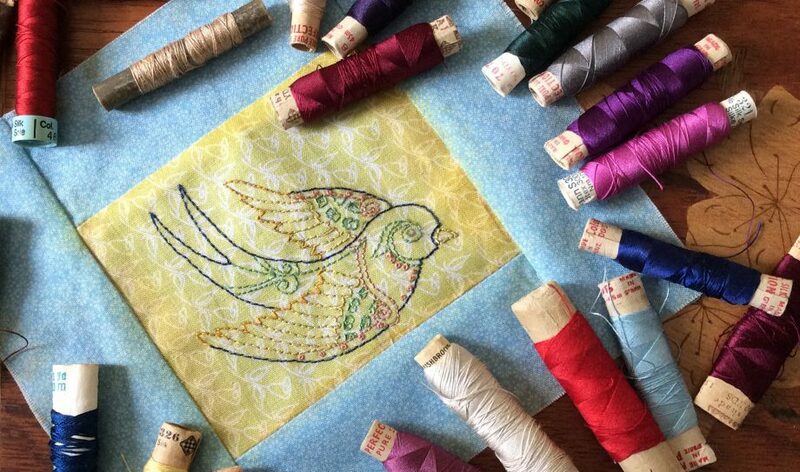 Designing my own quilt is always on the list. When taking a free motion quilting class and things were not going well. The teacher said if you make the same mistake 3 times it’s a pattern ! Go with it! With blogging, don’t give up , you will have one of those ” light bulb ” moments and wonder why you didn’t think of that before. Many thanks to our hosts for their support and a great group of girls who have been inspirational. Give our hosts a visit and there are prizes to be won! Just love these tiny blocks ! A couple more blocks for the collection , still no idea what we are going to do with them , will it be this Friday when we find out? My garden this morning with the sun shining so bright. 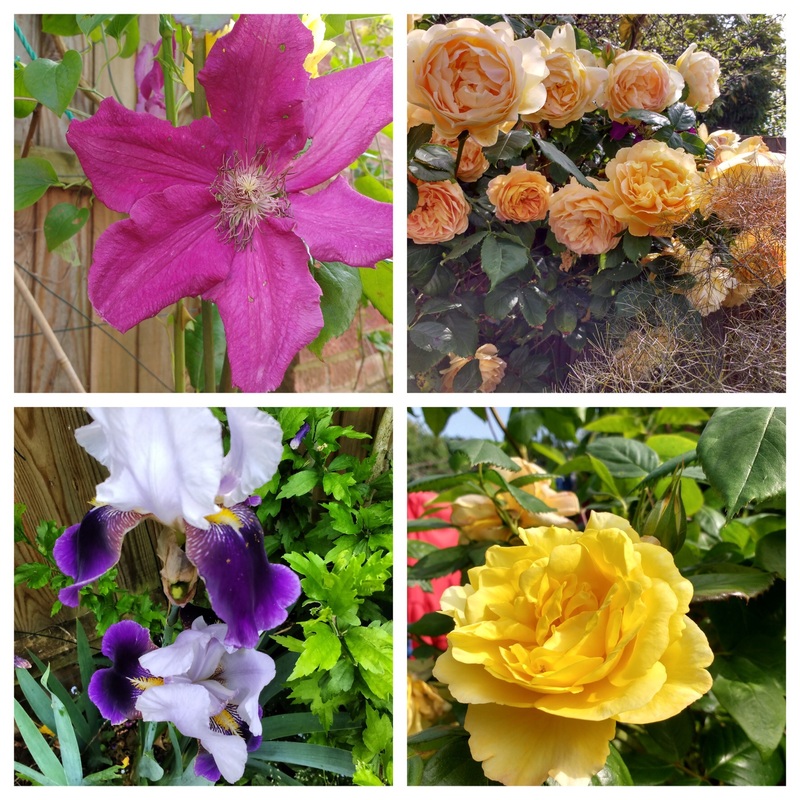 An English garden in June has to be one of the best places to be for it is full of colour and some of my favourite flowers are bursting with blooms. Have to leave the sewing machine for a short while just to take in their beauty and perfume. The back of the quilt is done ! I started quilting it with straight line quilting. Didn’t like it and spent the afternoon picking out those stitches. 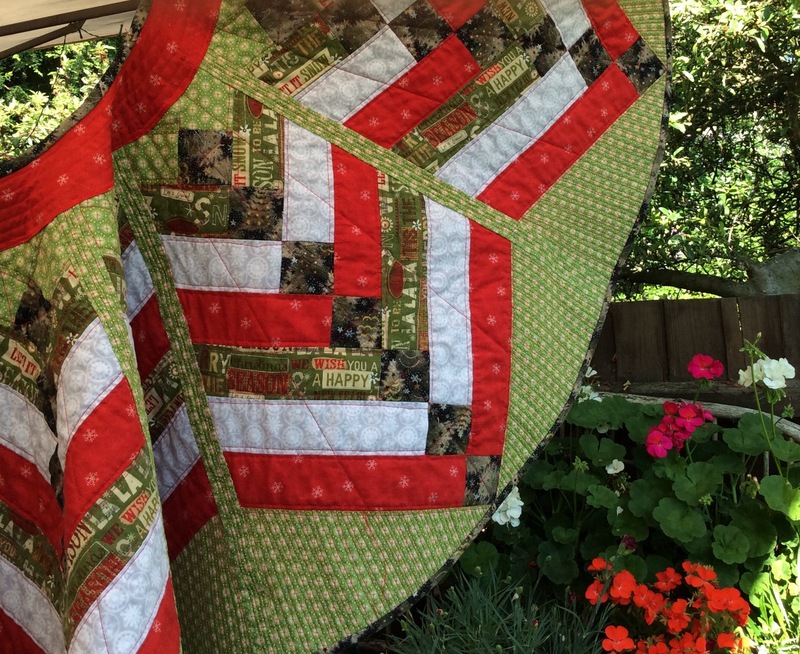 Just couldn’t resist this jungle panel, however, lining up back and front and finding a quilting pattern that looks good on both sides is giving me trouble. 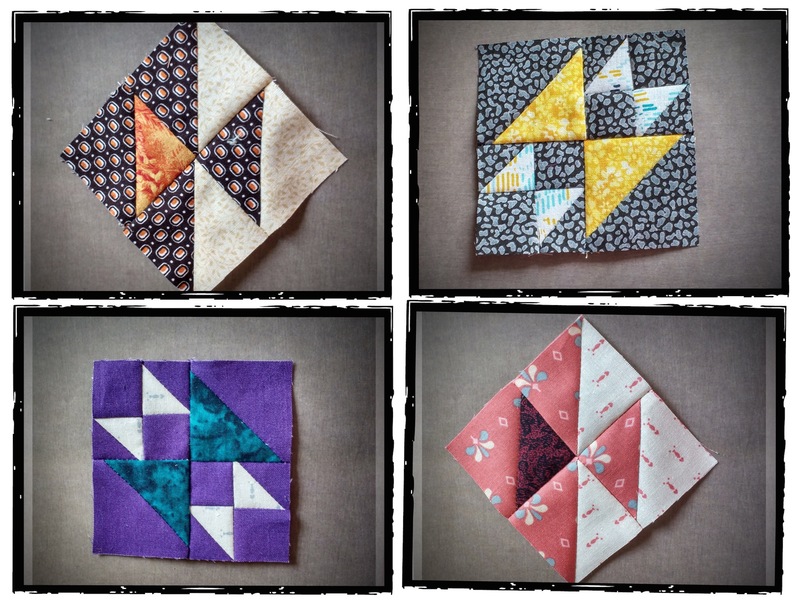 Now I’m going to sit and have a cup of tea in the garden, while the sun is out, thinking about how it should be quilted.